IV Cannula with Colour Coded Body, Injection Port and Wings with PU (Polyurethane Catheter) Tyvek Packing. 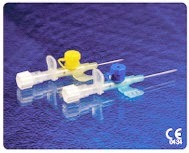 - PU Polyurethane Radio opaque catheter. Conforms to anatomy at body temperature reduce incidence of thrombogenicity. for easy insertion, bio compatibility and X ray detection. - Colour coded Body with suture hole wings for easy gauge identification and proper fixation.